Cloud Atlas: Doomed to fail in the U.S.? Cloud Atlas, the new Warner Brothers movie, seems at first glance to be everything a movie should not be in the U.S.: It has an intelligent story; it doesn’t feature any action heroes; the major romantic interests in the story all fail; and part of the storyline takes us into the future, automatically insuring an entire host of potential viewers will dismiss the movie as sci-fi right off the bat, and avoid it like the plague. In fact, so far the most vocal complaints about the movie have been either about a lack of understanding of the story or a complaint about the heavy use of prosthetics to turn the lead actors and actresses into different people, different personalities, different races, and even different genders, running from storyline to storyline. To be sure, the jumping from story to story, forward and backward in time, can take getting used to. Personally, I didn’t like the way the process was used in Pulp Fiction. On the other hand, I thought it was used perfectly in Lost. Cloud Atlas takes similar effort to keep track of the pieces, but it’s not that difficult… especially to those who have grown up watching flashback-heavy television programs. As to the complaints about race- and gender-bending acting: It was a daring move for the Wachowskis and Tom Tykwer to use the same actors in multiple storylines, as an attempt to make it easier for the audience to connect the common souls in each story. Why daring? Not because of its artistic merit: The method is poetic, familiar to audiences and very effective. It has a time-honored tradition in theatre and movies, where visual shorthand is the established norm, in fact, a vital part of the effectiveness of movies and theatre. No, it was daring because it was presented to a U.S. audience that is hyper-sensitive to race and gender relations. Thanks to centuries of socio-racial class warfare, Americans fret incredibly about the mere suggestion that one race or gender is not considered as good as another race and gender. Many viewed Cloud Atlas‘ use of European men, for instance, given stereotypical (and very unrealistic) folds over their eyes to play Korean men, as a suggestion that Korean actors weren’t good enough for those roles. In obsessing over this detail, audiences will completely miss the point being created by the directors, and so will miss the point of the movie. They are reacting much like a modern moviegoer who, presented with Citizen Kane, is too obsessed with the lack of color to pay attention to the story or the incredible visuals on screen. Unfortunately, the majority of the U.S. moviegoing audience constantly, consistently prove themselves to be exactly that superficial. They will line up for The Expendables 2, but will turn up their noses at a story with substance and intelligence. And in fact, Cloud Atlas has already been considered a bomb at the box office, and has been relegated to late night showings in the multiplex theatre room in the back with maybe forty seats and whose screen is not much bigger than your home TV. Does that mean Cloud Atlas is a failure? Only if box office figures are the only thing you care to measure. In terms of artistic merit, Cloud Atlas has accomplished an incredible feat, trying together a half-dozen disparate stories, linked by slender but often significant threads, and played across the eras by the same actors, into a wonderful mosaic and a beautifully-crafted movie. Avoiding this movie would be doing yourself a serious disservice. Fortunately, there’s always the aftermarket, where DVD sales have often proven to be the big money-maker over theatre sales. And as audiences get the chance to re-watch Cloud Atlas, and to better understand the stories and their connections, they may come to understand how incredible the movie is… and how unfounded the criticisms are. Daring? just as some ppl would look at a shirt draped over a chair and call it modern art, i’d call it lazy and this is same old Hollywood. Daring would have been black facing or using an Asian actor to lead in a big budget Hollywood film. Neither happened. To say that ppl have missed the point on connectivity because they couldn’t overlook the sensitive issue of race is incredible. Race is not equal in real life so why tell people to forget about it. So, you’re saying the “yellowfacing” done in Cloud Atlas wasn’t daring, but “blackfacing” would have been? I don’t see the distinction. And no comment about having an African actress (Halley Berry) play a Korean and a Jew? Is it okay when a non-white plays a white, but not the other way around? 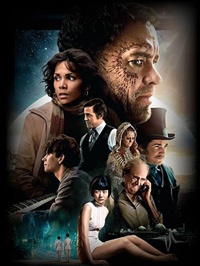 At any rate, I note that there have been more comments about the movie being incomprehensible to viewers; but in fact, the stories told in Cloud Atlas were all straightforward and clear, right down to the connections between stories, leading me to believe that audiences were too hung up on racial issues and stereotypes created by using actors of any race in multiple roles of any race to pay attention to what was, to me, a perfectly comprehensible movie. Race isn’t the issue. Prejudice is. (Something else the movie touched on a few times… I hope you noticed.) Race means NOTHING, and clouds those who obsess about it to much larger issues.